IF YOU think a Broadmoor is just for "mowing grass", you need to get better acquainted with this jillion-job tractor. Lawn mowing is one of the things it does as carefully as a barber. Other lawn tractor companies talk about "no scalping", but Simplicity mowers are the ones that really prevent scalping, because of the patented mounting on every tractor we build. The Broadmoor wades through a heap of other chores with the same kind of care and owner convenience. 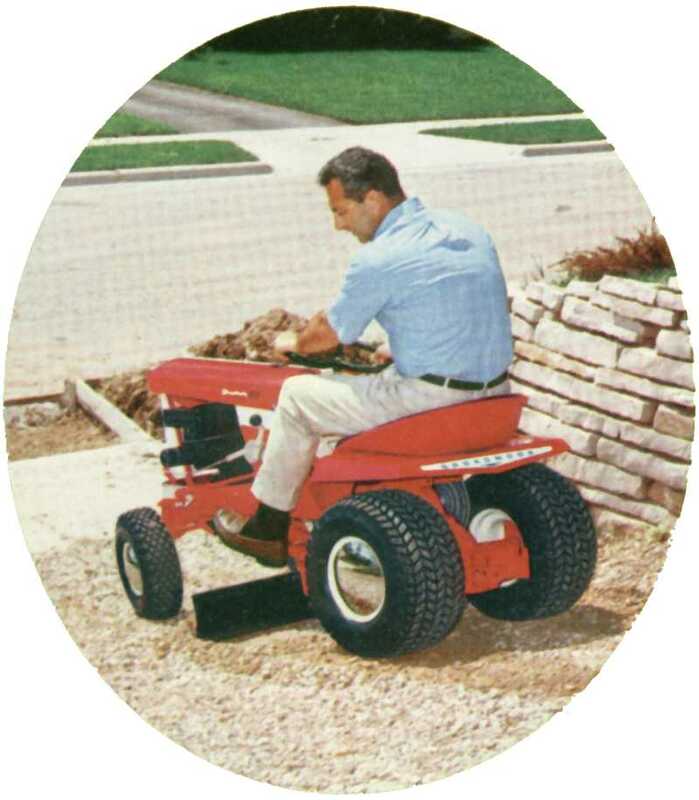 Its full line of attachments lets you replace muscles with mechanization, taking the grind out of yard chores while you ride in comfort. The Broadmoor's great for collecting leaves and grass, grading, hauling, mulching, snow removal and weed clearance . . . and you can switch from one chore to another in minutes with Broadmoor's quick-switch attachments. It's an all-year worker that's always ready to help and never asks a cent for overtime. If you're really serious about wanting more time for fun and family, put a Broadmoor in your garage . . . and more leisure in your living. 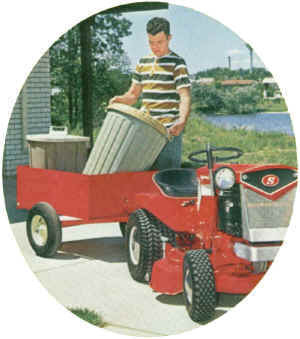 HALF-TON DUMP CART (No. 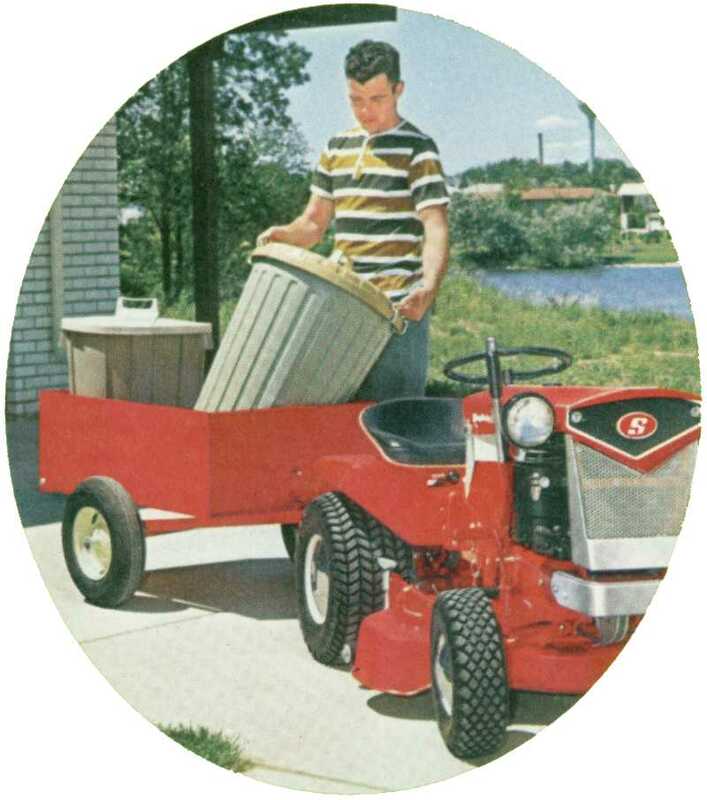 990085) This sturdily constructed steel cart eases the work load of any yard care program m it hauls seed, fertilizer, heavy or bulky implements, and is great for dumping waste of all kinds. Unit box can be completely tipped away from the frame, a patented dumping feature, without disconnecting the trailer hitch or lifting the trailer wheels from the ground. One-pin hitching, and tailgate is detachable. Capacity: half-ton, size 39"x26"x 12". VACUUM COLLECTOR. (No. 990443 -- Requires No. 990444 adapter) Whisks off leaves and long clippings without causing a callous. 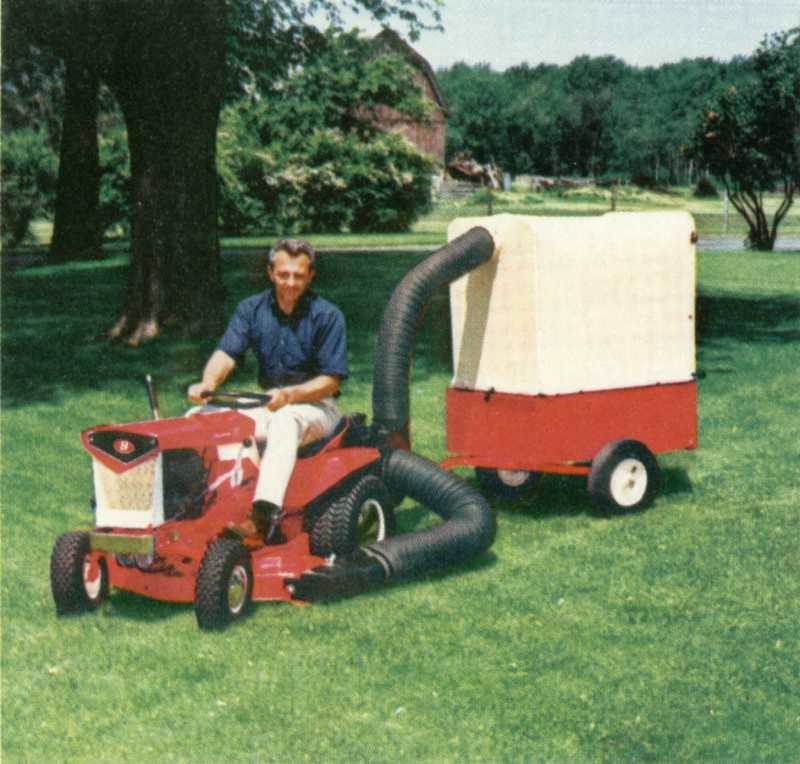 It simultaneously vacuums and mulches leaves and grass clippings as you mow, and propels them into an extra large grass container. Heavy-duty, all-weather canvas bag features sturdy removable rear door that's extra wide for easy dumping. Attaches in minutes to the 36" rotary mower and dump cart. 3-GANG MOWER (No. 990273) Work always goes faster when the whole gang pitches in, and that's the case with this mower. 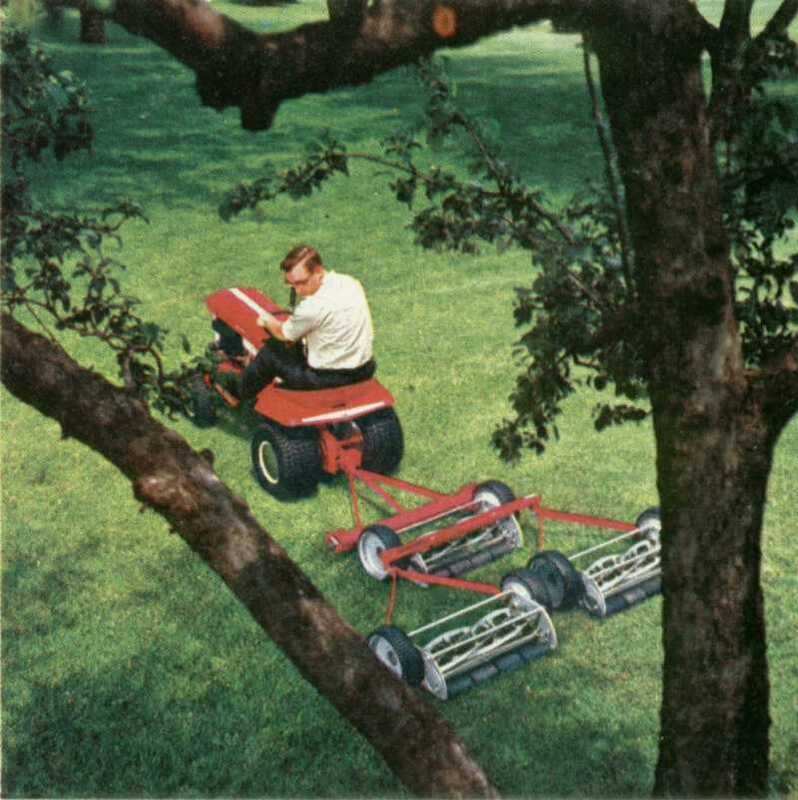 Three 22" ground-driven mowers smooth over 2 acres per hour, covering a 5' wide swath and reducing any big lawn to small patch proportions. Heavy-duty construction gives long, service-free life under constant use. Has extra wide tires to prevent marking.